Apple's vice president of Worldwide Government Affairs Catherine Novelli has been nominated by President Barack Obama for Under Secretary for Economic Growth, Energy, and the Environment, a post at the State Department. The nomination to President Barack Obama's administration was made official on Tuesday by the White House, reports AllThingsD. 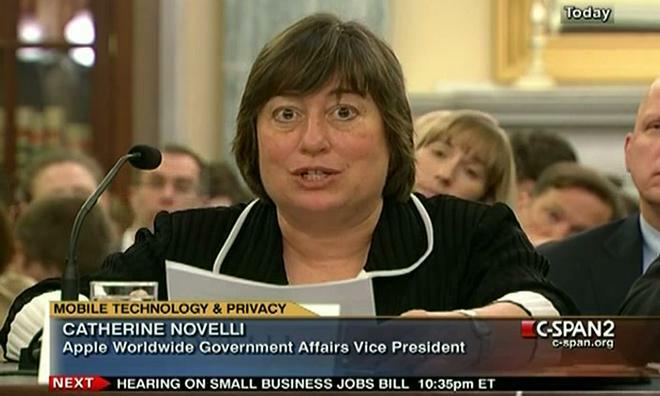 Since 2007, Novelli has been employed as Apple's lead lobbyist, but her pedigree in U.S. politics dates back to the 1980s. From 1985 to 1991, Novelli served in the Office of the General Counsel at the Department of Commerce and was a top trade representative for the George W. Bush administration. While Apple isn't known for its lobbying prowess, the company has ramped up its presence in Washington after becoming the largest tech company in the world. According to a Reuters report from May, Apple spent around $2 million in its lobbying efforts last year, but is expected to double that in 2013. Chief among the company's concerns is taxation on profits held by offshore subsidiaries. In comparison to other tech firms, Apple's spending is quite low. For example, Microsoft's lobbying expenditures were pegged at $8 million in 2012, while Google spent $16.5 million during the same period. Prior to Apple, Novelli was a partner at law firm Mayer, Brown, Rowe & Maw.